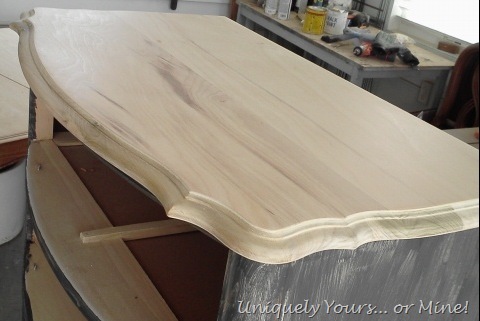 A Little Bit About Finishing Dresser Tops – Uniquely Yours… or Mine! 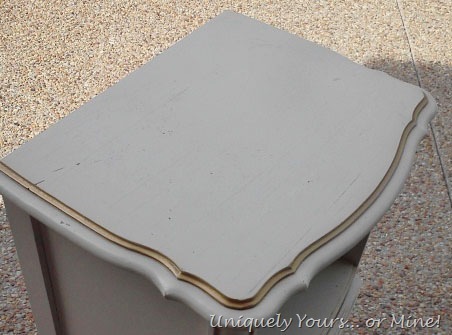 I had a conversation yesterday with Deb over at Confessions of a Craigslist Junkie about removing laminate from the top of those French dressers from the 60’s-90’s… you know the white slick looking topped ones… well she just painted this gorgeous dresser, top and all, I think it’s lovely the way she painted it, but I also knew that she had the option of staining the top if she had wanted to. I thought I’d share with you a few experiences I’ve had so a little information is coming your way! Here is your typical dresser from the early 80’s. It’s hard to tell in the sunlight but this was most certainly that slick looking white surface. I sanded it down starting with 100 grit paper, then 150 ultimately finishing with 220. Using my orbital sander I didn’t have to worry about going with the grain of the wood… it just sanded down like any other painted surface and I was left with the top below… amazing right? 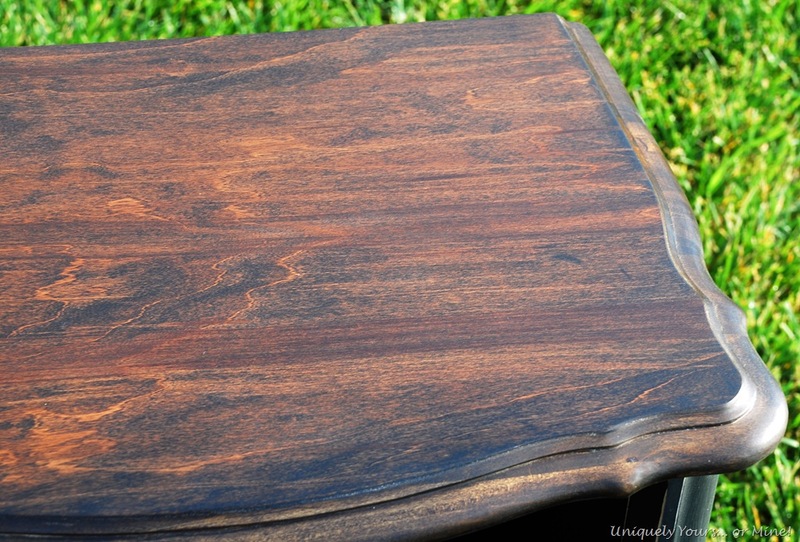 This is what it looked like after some dark walnut stain and a coat of wax! BOOM!! pretty solid wood underneath that gross surface. All pretty now with a dark walnut stain and a coat of wax. 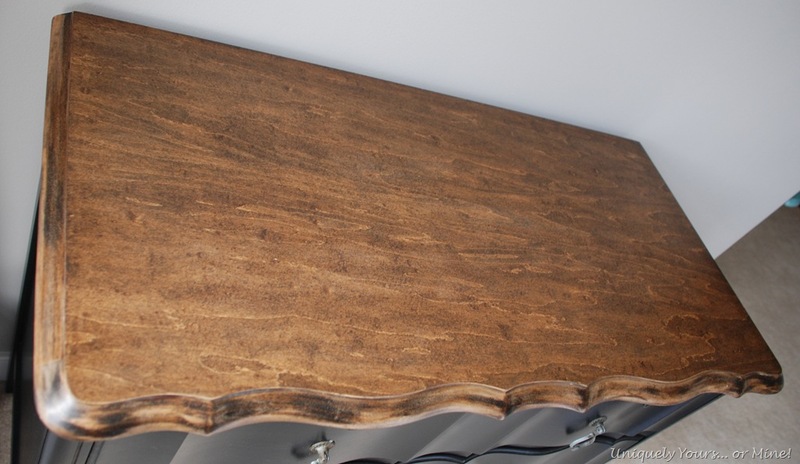 GORGEOUS solid wood top, stained dark walnut and waxed! I kept this chest because I loved it so much I couldn’t let it go! So next time you walk by one of “those” pieces think about trying to sand down the surface to reveal the beauty beneath! I’m no expert and I’m certainly not saying every piece will turn out like the ones above, but it can’t hurt to try right? That is what I did and I loved the results! Good luck and go sand something! 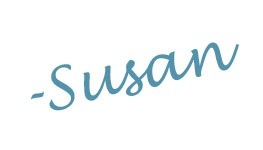 Wow Susan, your results are amazing! I’ve never tried sanding that finish down, but I definitely will next time! Definitely trying this the next time I get one of these pieces! 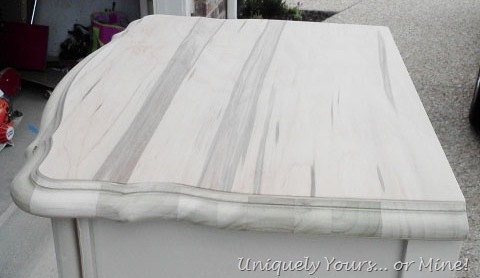 I have a bunch of questions about how you sand since your tops came out perfect! Do you sand the edges or strip them? I usually start with 60 grit paper–do you think that is too harsh? I keep getting swirl marks. I try not to move the sander around too much, but if the sand paper gets some of the finish stuck to it, then it leaves marks too–any advise? The last thing I sanded I went through so many pieces of sand paper with each grit–is that normal? I appreciate any advise you can give! These look amazing. I had no idea they could look so good. Great job. What paint did you use on the black one you kept? I love it. Hey Tammy! I just used Valspar black, already mixed… I’m glad you liked it! 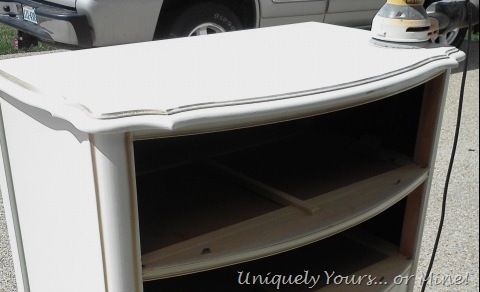 I refinished several of those pieces…I have no idea if I would have found that underneath…but I wish I’d looked! I hope you peek next time! I love your unpainted wood tops. I think they add richness to the piece. I have a question for you: can you use any wax over stain, or do only certain stains and waxes work together? The stain I’ve been using says to protect with varnish, and the wax I purchased says to use on natural wood. So confusing…(and I’ve been getting a lot more requests from clients to refinish wood). I need expert advise! Thanks so much! I try to leave them natural when I can! Yes, you can use wax over stain or paint. I would use a dark wax or clear wax on darker stained wood as sometimes the hard yellow paste wax can show up white in the tiny fissures in the wood when it dries. You can also use an oil like Watco to seal the wood, it’s not as shiny as wax and has more of a rustic look. Hope this helps! Thanks…I think I’ll have to practice with my own wood furniture! Great information Susan! The dressers look so pretty with a stained top! Wow, that is really good to know!! Ack! I just painted the top on one of these! And the last one, I did my faux wood glaze. Maybe I could have just popped out the belt sander and there was the wood!! Tried this on 2 pieces last night… sadly, it was pressed wood underneath 😦 Doesn’t mean I won’t try it again with the next piece I find! Thanks for sharing, it looks beautiful! Argh! I’m sorry… I hoped that it wasn’t just dumb luck that I had great tops! Hope you find one when you need it! Amazing work!! What wax do you use? I am so unfamiliar with that, is it similar to a poly? Does it replace the poly? I use Annie Sloan clear wax, clear Briwax or Johnson paste wax depending on the piece. I use wax in place of poly, I rarely use poly at all. Hope this helps! Thanks so much! It’s Annie Sloan Graphite. Hey Emily! The only way I know to do it is with folded over small piece of sandpaper. You could try a small stripping knife or blade, but be very careful not to gauge the wood. If you have a dremel tool there are several sanding options you can use with that as well. Good luck! Thank you for publishing this. I have stripped many pieces of furniture over the years and this is the first piece where the stripper did not remove the paint. I am happy to see that sanding took off the paint. I will not waste more time and money on trying to strip the top. Although I always prefer to strip the paint before sanding and staining, I see how beautifully yours took the dark stain. Another great option is a heat gun, it works great but you need to be careful. Good luck with your project, I hate the stripping process myself!